I have been using bayantel internet connection as my Internet Service Provider for almost four years now. Bayantel DSL broadband has a good customer service and they offer 24 hours quick fix. That means that if you call for their service for DSL support within 24 hours they will resolve the issue or if not they will give some rebates depending on the number of days that your internet was bad. It also depends on the factors on the issue of your problem because some issues need to be monitored before it is being closed. Because I have been loyal to their service, a customer service call me at my mobile phone to offer a speed upgrade promo. From 1.2MBPS download speed after the speed upgrade it became 2MBPS. For 1.2 MBPS, I am paying Php1, 699 monthly plus 300 for the bundle phone. With the speed upgrade, there will be an additional Php300 monthly fee that will be added to my monthly bill but since it is their promo I will only pay an additional Php100 for five months for the speed upgrade. There is a locked in period for 12 months if you avail for the speed upgrade. My family is planning to move at our new place in bulacan next year. I hope there is also Bayantel service there but there is none when I inquire. There is PLDT service there and I hope when we applied for this service it will be good as the service that I have with bayantel. How about you? What is your internet connection? 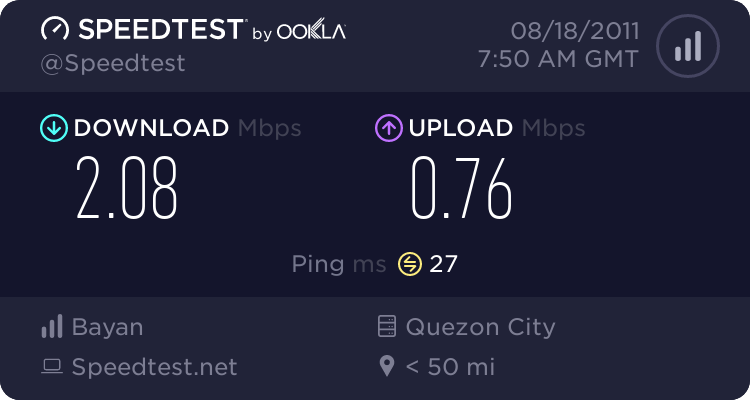 This entry was posted in Internet and blogging and tagged bayantel internet speed upgrade, bayantel service provider, good internet connection. Bookmark the permalink.